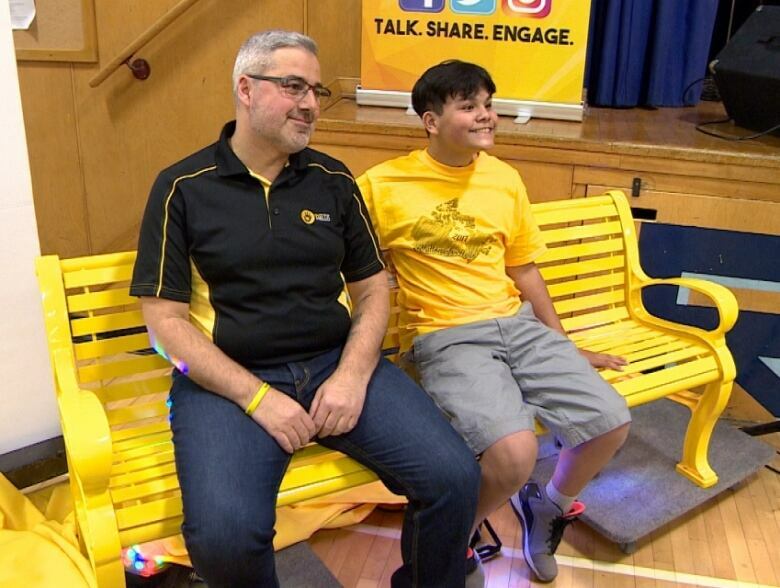 A bright yellow bench with an immensely hopeful purpose — designed as more than just a place to sit — was unveiled in Winnipeg on Thursday. The friendship bench inside Grant Park High School is part of a national campaign to get young people thinking and talking more about their mental health. "Kids are definitely more stressed today than they ever have been before. I used to tell my son all the time, 'I've been there; I've gone to university, I get it.' It's not true. I don't get it," said Sam Fiorella, who founded the Friendship Bench initiative in Ontario. "I now realize how ignorant I was of mental health." Fiorella was inspired to start the initiative after losing his son Lucas to suicide in 2014. 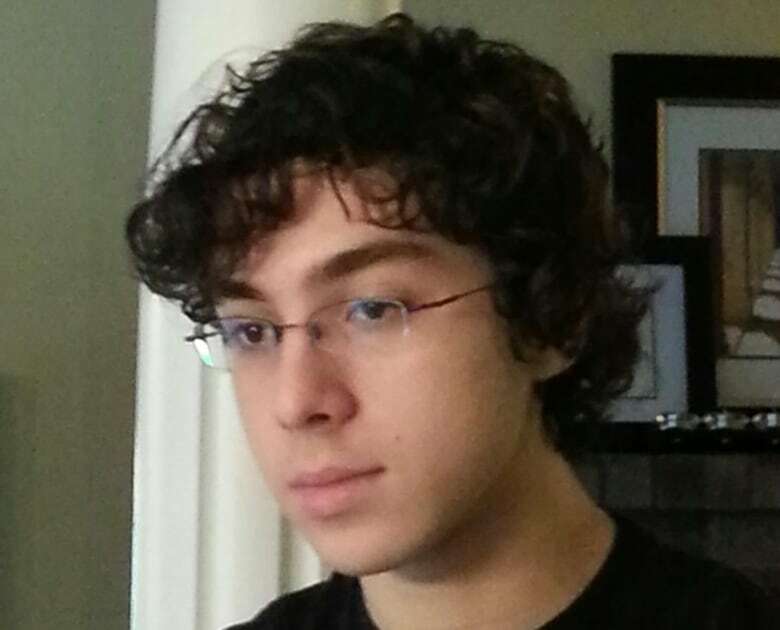 At the time, Lucas was in his second year of university and suffering with depression. "He had been suffering for about seven years with depression in silence," Fiorella said. "Outwardly he was a normal teenage kid." Although he wasn't able to speak about his own battles, Lucas did help many others with their problems, Fiorella said. At Lucas's funeral, Fiorella was told by many of his friends that he took time to say hello or reach out to them when they needed a shoulder or a kind word. "We discovered a lot of people were saved by Lucas. He just saw something in their eyes, we assume," Fiorella said. In Lucas's memory, Fiorella wants to help others open up before it's too late. He created the #YellowIsForHello campaign to encourage peer-to-peer conversations about mental health. "We decided that the best symbol for people talking to each other would be a bench," Fiorella said. "No one knows for certain how much impact they have on the lives of other people, but we have to at least try our best and start with a 'Hello.'" There are 27 of the yellow benches across Canada now, with five more being installed this week, which is Mental Health Awareness Week. The Grant Park one is the first in Winnipeg. The other four being put in this week are in Regina, Edmonton, Vancouver and St. John's. "We really believe in the concerns of mental health with our students and we have a major push in our school to work with our students regarding mental health," said Phyllis Hidichuk, department head for student services at Grant Park High school. The school already offers a wellness room, a kinesiologist, an occupational therapist and a guidance team for students who need support. The bench, which will be located in a hallway just outside the wellness room, was a natural fit, she said. "We're seeing a lot more students with anxiety, depression, and they're coming and they're talking about it. And we want them to continue to talk about it," Hidichuk said. "Mental health is not a mystery; it's not a secret. We want to talk about it, we want to have people be aware of what it is, what we can do for it, what preventative measures are available. "We want it visible in our school."